Frosh Appeals to Young Voters with Film "18 in '08"
David Burstein '11 has created a documentary aimed at getting newly eligible voters to exercise their rights in the '08 election. See the film December 6 at 9:00 PM in Stokes. This early political education has come to fruition in the documentary film“18 in '08,” which Burstein directed and produced. With a goal of getting more people ages 18-24 to vote in the 2008 election, the film includes interviews with politicians from both sides of the aisle as well as actors, cultural figures, media commentators and student leaders.“18 in â€˜08” examines the stakes of the next presidential election, explores the issues and ideas important to today's youth, and reveals the ways in which politicians' decisions affect young America, as well as the role new media and technology plays in mapping the political landscape. He began filming in July of 2005, amassing an impressive list of interview subjects from family and friend connections and from his own persistence. He secured the cooperation of many senators and representatives simply by calling their officesâ€”repeatedlyâ€”and stressing the importance of his project. He also attended the conferences of the College Democrats and Republicans and polled student attendees. 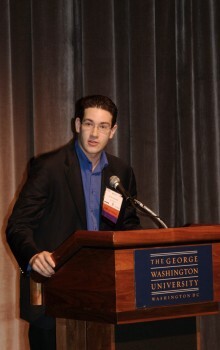 From his student interviews, he uncovered myriad reasons why many young people avoid political involvement:“People don't have time, aren't interested, don't have enough access to information, care about things but don't think the government can handle them, are generally cynical and turned off by the corruption.” Burstein also found that the issues young people consider pivotalâ€”the Iraq war, health care, social security, Darfur, gay rights, abortionâ€”don't differ much from the concerns of older voters, with the possible exception of college tuition and student loans. He has his sights set on a major launch in January 2008. He's hiring a PR company to orchestrate a media campaign, and hopes to hold a screening every other day right up until the election. He also has in the works a 50-state tour during the summer and a high school/college tour in the fall. And somehow, he still finds time to enjoy his first year at Haverford, where his own political activism is slowly flourishing.“I've attended some meetings of SPN (Student Political Network) and the College Democrats, and I'm on the Council of 12,” he says.